LOS ANGELES/SACRAMENTO, Calif. (Reuters) - Southern California's biggest drinking water supplier will seek an option to buy 20,000 acres of river delta farm land east of San Francisco, a deal that could benefit a controversial tunnel project to carry Northern California water southward, the agency said on Tuesday. Officials at the Metropolitan Water District (MWD) of Southern California denied criticism that the move portends a land-water grab in a region long suspicious of efforts in the drier southern part of the state to gain more water from the north. The property under consideration by the district consists of four islands in the Sacramento-San Joaquin River Delta that are now owned by Delta Wetlands Properties, a U.S. subsidiary of Swiss-based Zurich Insurance Group, and used mostly for farming. Land values cited by the water agency could put the cost of buying 20,000 acres at $150 million to $240 million. If eventually purchased by the district, it would be the first delta land the agency has ever acquired. But critics worried that it might not be the last. "The potential takeover of land and water rights ... is akin to what happened to landowners in the Owens Valley," said Barbara Barrigan-Parilla, head of the environmental group Restore the Delta. She was referring to a century-old chapter in California's water wars in which the city of Los Angeles bought up distant tracts of land to divert Sierra Nevada-fed runoff from the Owens River and carry it some 200 miles to the south. Metropolitan Water District (MWD) officials insisted the amounts of water immediately at stake were minimal. Acquisition of the property in question would yield direct access to no more than 10,000 acre feet of water a year, agency officials said, a tiny fraction of the volume MWD supplies to 19 million people in a vast service area encompassing Los Angeles and six counties. "That in and of itself would not interest Metropolitan," Jeffrey Knightlinger, MWD's general manager, told reporters on a conference call after its board voted to pursue a deal. Instead the land offers greater potential benefits for wildlife preservation and wetlands restoration projects that could offset environmental impacts of future water works elsewhere, Knightlinger said. 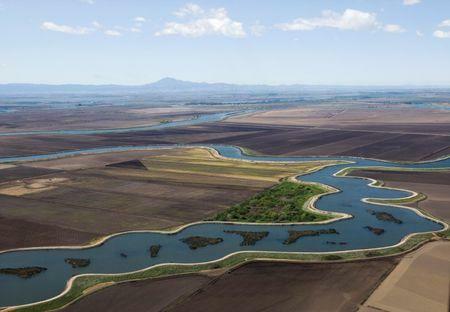 Moreover, two of the islands lie in the path of two giant tunnels California Governor Jerry Brown has proposed digging beneath the delta as part of a $15 billion project he has said would ease some of the state's protracted water-distribution woes. The MWD is a strong backer of the project and the land deal would avoid the need for costly eminent domain proceedings to acquire the portion of the tunnel route that traverses the two islands, the agency said. Supporters see the tunnels as crucial to keeping sufficient water supplies delivered to the state's arid San Joaquin Valley breadbasket and the heavily populated southlands. But the project is opposed by conservationists who say it would rob the delta of increasingly scant water flows needed to sustain marsh habitat for threatened fish, birds and other wildlife, with too little environmental mitigation planned. Water rights in the delta, a hub of California's surface water network, have become especially sensitive as the state copes with a fourth year of drought that has fallowed hundreds of thousands of acres of crop land, threatened habitat for birds and fish, and spurred the state's first-ever mandatory conservation orders.